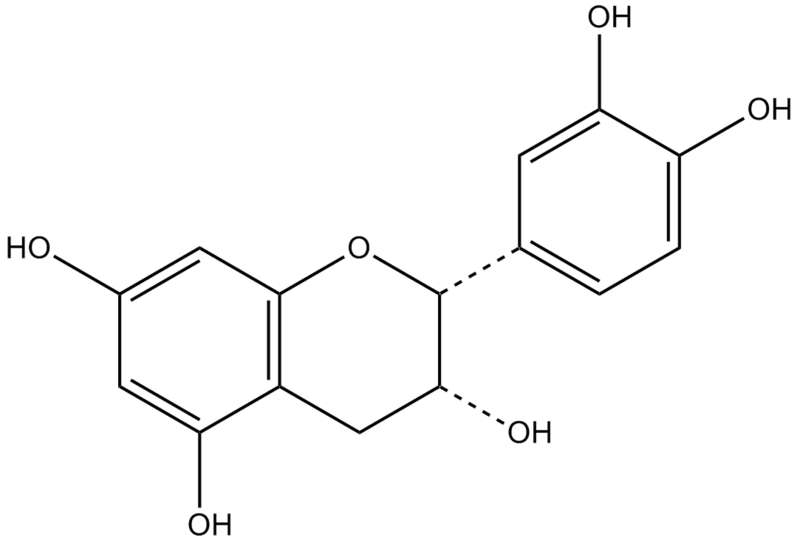 (-)-epicatechin is a flavonoid that increases NO levels and an inducer of pancreatic β-cell regeneration  . β cells are a subset of cells in the pancreatic islets and play an important role in regulating glucose homeostasis through the production of insulin. (-)-epicatechin is an inducer of pancreatic β-cell regeneration. In murine macrophages, (-)-epicatechin induced nitrite accumulation induced by interferon-γ/lipopolysaccharide with IC50 value of 0.5 mM. Also, (-)-epicatechin inhibited nitration of free tyrosine induced by 0.1 and 1 mM peroxynitrite with IC50 values of 6.6 and 28.0 µM, respectively. In HL-60 cells, (-)-epicatechin inhibited nitration of protein-bound tyrosine induced by phorbol 12-myristate 13-acetate with IC50 value of 10-100 µM . In human endothelial cells (HUVEC), (-)-epicatechin (0.3-10 µM) increased NO levels, suggesting its vasodilatory properties . In alloxan diabetic rats, (-)-epicatechin (30 mg/kg) lowered blood sugar and restored the amount of beta-cells against alloxan-induced necrosis of the beta-cell population in the pancreatic islets. In rats, (-)-epicatechin was non-toxic up to 1 g/kg . In rats, oral administration of (-)-epicatechin metabolized to 3’-O-methyl-(-)-epicatechin and 4’-O-methyl-(-)-epicatechin .
. Chakravarthy BK, Gupta S, Gambhir SS, et al. Pancreatic beta-cell regeneration in rats by (-)-epicatechin. Lancet, 1981, 2(8249): 759-760.
. Wippel R, Rehn M, Gorren AC, et al. Interference of the polyphenol epicatechin with the biological chemistry of nitric oxide- and peroxynitrite-mediated reactions. Biochem Pharmacol, 2004, 67(7): 1285-1295.
. Brossette T, Hundsdörfer C, Kröncke KD, et al. Direct evidence that (-)-epicatechin increases nitric oxide levels in human endothelial cells. Eur J Nutr, 2011, 50(7): 595-599.
. Okushio K, Suzuki M, Matsumoto N, et al. Identification of (-)-epicatechin metabolites and their metabolic fate in the rat. Drug Metab Dispos, 1999, 27(2): 309-316.